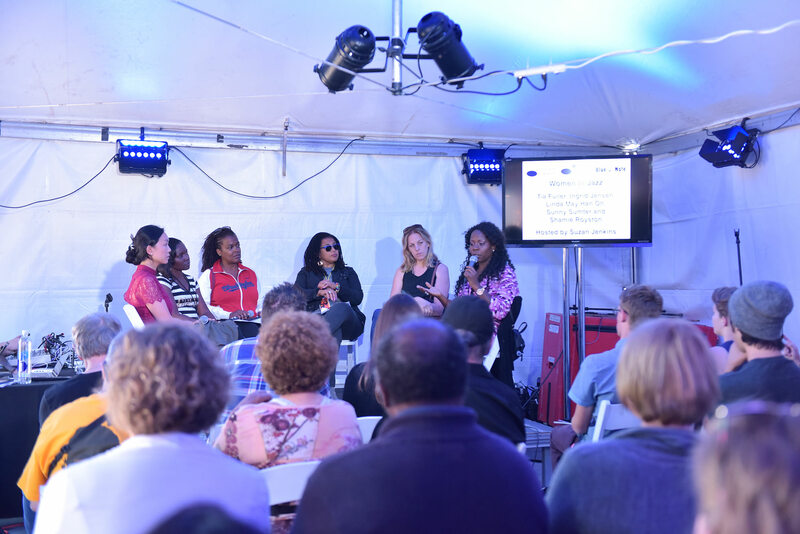 I’ve been fortunate to make scores of what, to paraphrase sports parlance, I consider scouting trips to jazz festivals large and small ever since the early 1970s; always an important part of my own professional development – as a media person, an arts administrator, and an arts presenter. And of course, there’s big fun to be had at jazz festivals large and small. It was in ’74 that I embarked on what became annual treks to the George Wein-produced summer festivals in New York. Depending upon underwriting sponsorship those festivals fell under the names Newport New York, Kool, and JVC Jazz Festival. The reason Wein’s Festival Productions team decamped in NYC in the first place was a result of controversial jazz festival intrigue. His Newport (Rhode Island) Jazz Festival operation had been – what turned out to be temporarily – suspended by town gentry outraged at the actions of an unruly crowd. This was at a time when Wein was broadening the scope of NJF by seasoning his lineup with assorted rock and crossover acts of the day, something that has become common practice of even the highest profile jazz festivals. In short, some audience members drawn to the tony burgh located on the south end of Aquidneck Island on the shore of the Narragansett Bay apparently arrived expecting free admission and subsequently stormed the barricades in protest. So in the mid-70s Festival Productions built those major NYC festivals in the stylistic image of Newport, at venues ranging from Lincoln Center, Carnegie Hall and Town Hall, to assorted clubs and university auditoriums. Fast forward to the mid-90s when my 18-year tenure as artistic director of Cleveland’s Tri-C JazzFest commenced (which was augmented for a hot minute in the aughts by a couple of years artistic directing Boston’s Berklee-run Beantown Jazz Festival, an an advisory role in the development of the Mid-Atlantic Jazz Festival). Currently three years in as artistic director of the DC Jazz Festival, jazz festivals large & small have been a passion for over 40 years, including more festivals than I care to recount here, both domestic and foreign. 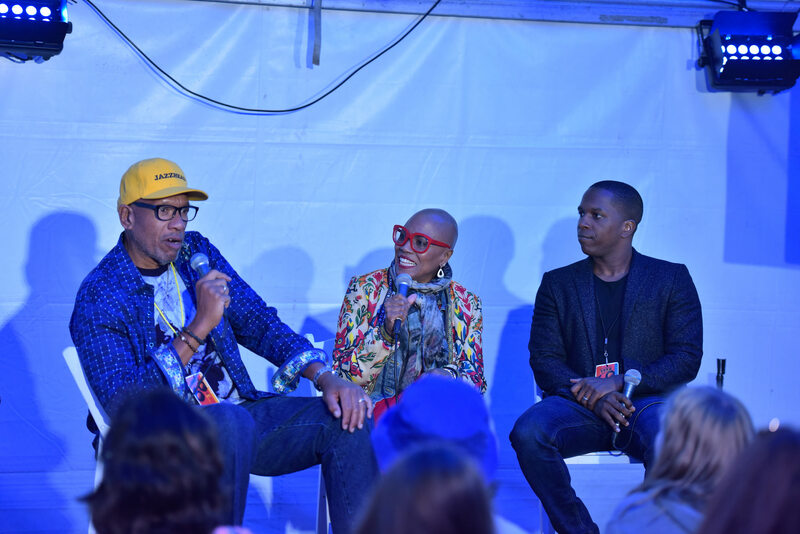 Visiting jazz festivals has been both immensely pleasurable and highly instructive, to the point where trips to the two grandaddies – the Newport and Monterey Jazz Festivals – have become as mandatory as budget will allow. This year was no exception as we had another round of splendid and very instructive visits – actually they’ve become pilgrimages – to both. 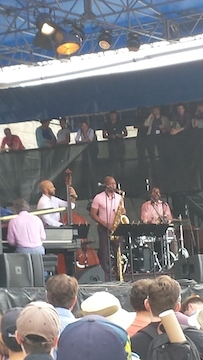 The Newport Jazz Festival (presented by Natixis Global Asset Management), which about a decade ago expanded its staging from the traditional big stage abutting Fort Adams and facing the idyllic bay, to add a courtyard stage and a harbor stage, is now artistic directed by one of the busiest men in jazz, bassist Christian McBride. The Newport lineup this year certainly reflected McBride’s Philly pride, from his own soulful big band to his occasional Philadelphia Experiment trio with Philadelphians drummer Questlove (McBride’s high school classmate) and keyboardist Uri Caine and guest DJ Logic, to the Benny Golson Quartet, to pianist Orrin Evans playing solo and as part of trumpeter Sean Jones band, to the Roots closing out late Sunday afternoon. McBride and festival producer Danny Melnick laid out a tasty menu that also included in addition to the Roots, the crossover presence of Afro-Americana vocalist-banjoist Rhiannon Giddens, funk master Maceo Parker, and Jason Moran‘s Fats Waller Dance Party. The Maria Schneider Orchestra’s sumptuous harmonic universe played the main stage, while Cyrus Chestnut‘s ever-swinging trio, and a quartet of trumpeters gave a virtual state of the instrument on the harbor stage, including Sean Jones, Michael Rodriguez (co-leading with his brother pianist Robert), Theo Croker, and Cleveland’s own Dominick Farinacci. Sean (from Warren, OH) and Dominick are always points of pride as both participated in Tri-C JazzFest from their grade school days onward. 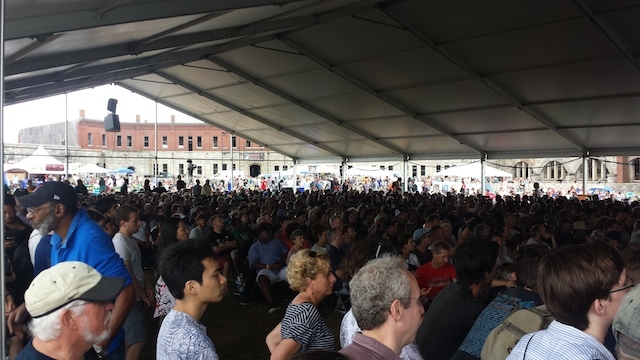 The outer edges of the music were well-represented at NJF by Henry Threadgill‘s Zoid, pianist Marilyn Crispell, the Wadada Leo Smith/Vijay Iyer duo, and composer Amir ElSaffar‘s Rivers of Sound Orchestra. Branford Marsalis highlighted the wisdom of keeping a stable quartet (Joey Calderazzo, Eric Revis, Justin Faulkner), Cecile McLorin Salvant continued building her rather quirky book with ancient songs of politically incorrect origin (like the Mad Men era “Wives & Lovers”), and the super quartet Hudson (Jack DeJohnette, John Scofield, John Medeski, Larry Grenadier) provided gourmet jam band food for the ears. A major highlight came in tribute to the sad recent passing of pianist Geri Allen. 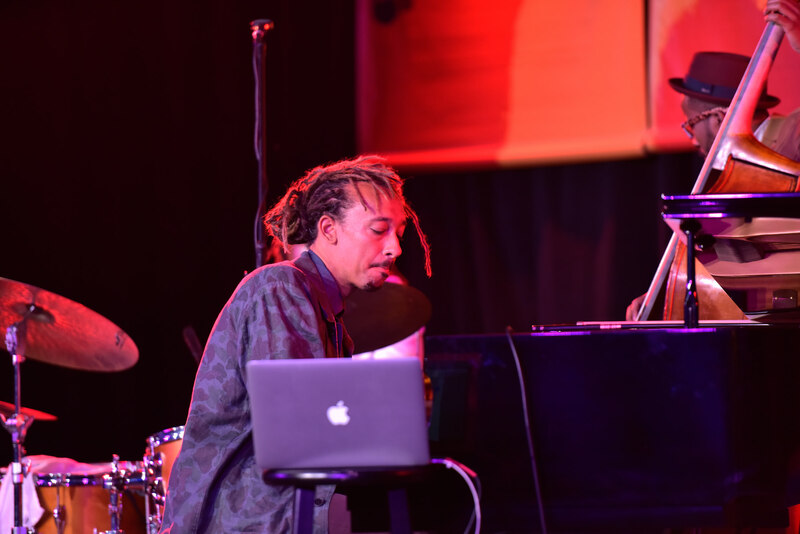 With Allen previously scheduled to join Terri Lyne Carrington and Esperanza Spalding to reprise their marvelous trio, instead TLC and Espe delivered a gorgeous, loving tribute to their partner with rotating pianists Christian Sands, Jason Moran and Vijay Iyer playing Geri’s compositions. Difficult topping those Newport proceedings, right? Along came mid-September and the 60th annual Monterey Jazz Festival, which more than lived up to its superb tradition. The Monterey County Fairgrounds welcomed nearly 40,000 patrons to its main (Arena) stage and five grounds stages this year. 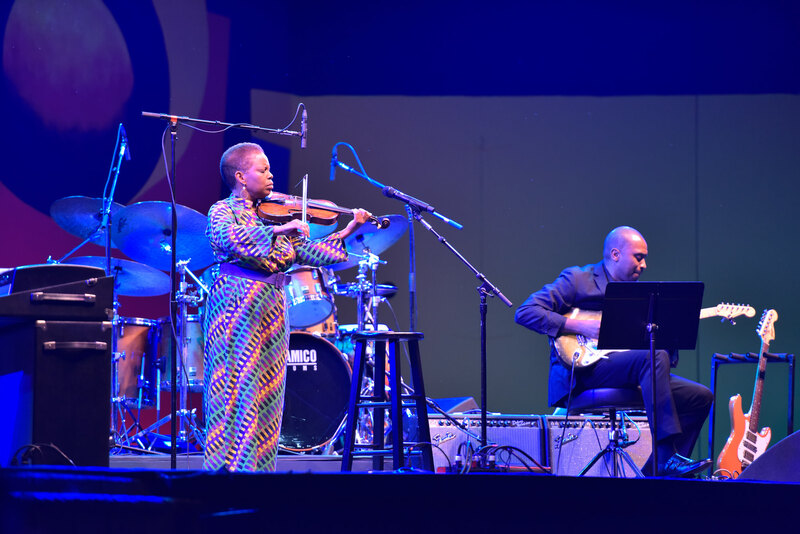 Delights of the garden were plentiful, from three performances by Showcase Artist violinist Regina Carter (including her Ella Fitzgerald and Southern Comfort projects), to John Clayton‘s commissioned piece celebrating MJF’s 60th through the broad canvas of the Clayton-Hamilton Jazz Orchestra. For that occasion Clayton was joined by son Gerald Clayton on piano, brother Jeff Clayton‘s tuneful alto saxophone, and partner Jeff Hamilton on drums stoking the fires. One artist common to both Newport and Monterey was Tony Award winning vocalist Leslie Odom, Jr. from Hamilton, who made scores of new friends with his gracious, sunny performances that included a Nat Cole medley. Another was Vijay Iyer, this time with his bristling sextet onstage at Dizzy’s Den to close out Sunday evening. 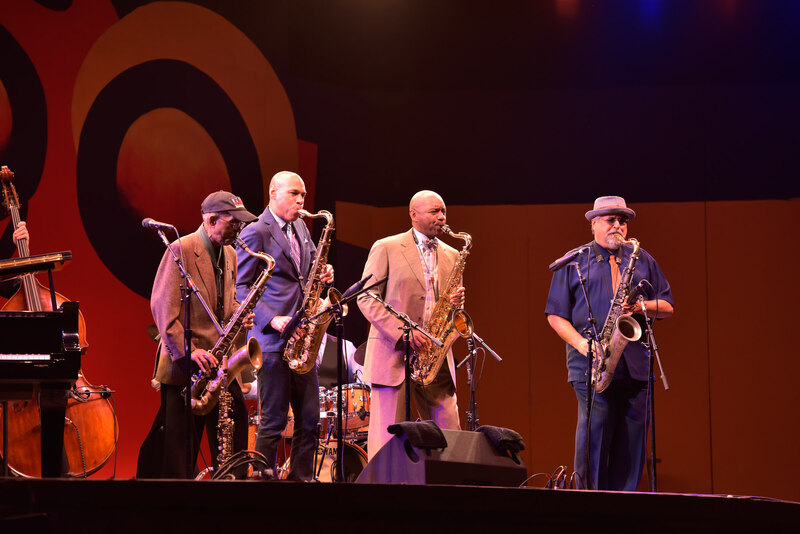 Saturday evening on the Arena’s Jimmy Lyons Stage (named for the MJF founder) delivered a masterful tenor sax summit, with Jimmy Heath, Joe Lovano, Branford Marsalis, and Joshua Redman honoring Sonny Rollins in royal fashion. Crossover delights came via rapper Common, who since his DC Jazz Festival appearance in 2016 has found a new home and creative environment on jazz festival stages, improvising his lyrical content to reflect the setting and giving ample space to the jazz-friendly soloists in his band, including one-to-watch flutist Eleana Pinderhughes. James Carter once again displayed his outrageous mastery of every saxophone nuance Adolph Sax could have ever dreamt up, Sean Jones made Roy Hargrove work hard for the money as guests on Kenny Barron‘s tribute to Dizzy Gillespie’s centennial, trumpeter Ingrid Jensen joined saxophonist Tia Fuller‘s hard driving quartet, bassist Linda May Han Oh (who had earlier collaborated with Fuller, Jensen, and Tia’s sister pianist Shamie Royston, DC Jazz Festival director Sunny Sumter, and moderator Suzan Jenkins for a Women in Jazz Panel that had the esteemed Angela Davis (a MJF regular) taking notes in the back of the room, delighted the Garden Stage with her quintet, and Angelique Kidjo joined Pedrito Martinez for a delightfully successful partnership of Afro salsa. As has become MJF tradition, several first rate Bay Area bands delivered on Monterey stages, as did a nice slate of emerging units, including Monsieur Perine, Ranky Tanky, Con Brio, and assorted student ensembles. 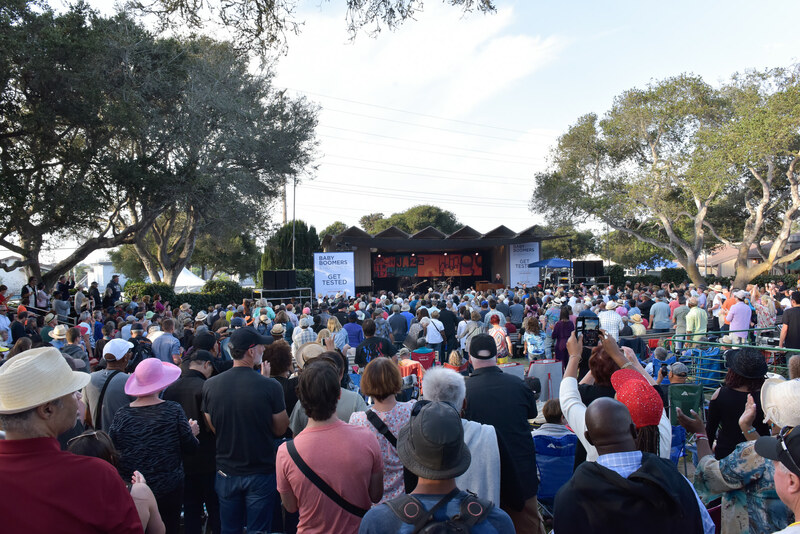 Sixty+ years into their respective illustrious runs, the Newport Jazz Festival and Monterey Jazz Festival proved once again why they represent the state of the jazz festival tradition. Panelists for the Women in Jazz discussion L to R: Linda May Han Oh, Shamie Royston, Sunny Sumter, moderator Suzan Jenkins, Ingrid Jensen, and Tia Fuller. When Suzan introduced the great activist-professor Angela Davis in the audience, afterwards Angela came up and said she didn’t know she was gonna be called out, she was back there taking notes! 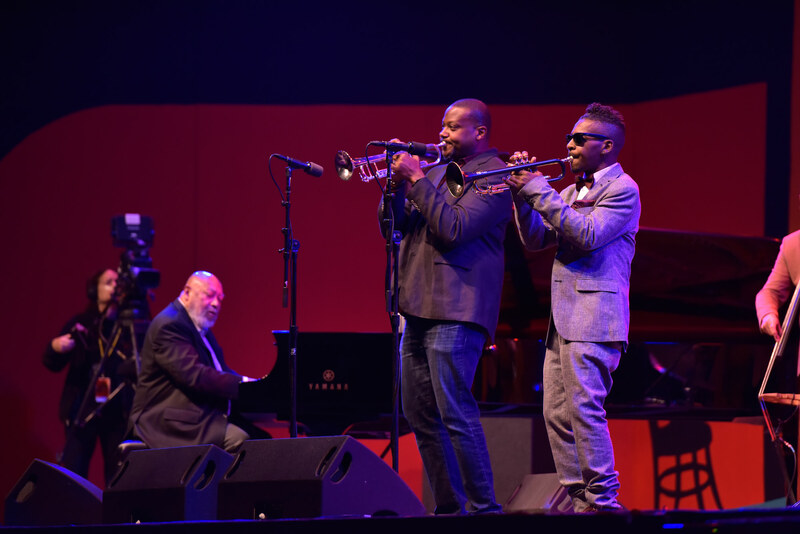 One of the MJF highlights came when Sean Jones and Roy Hargrove joined Kenny Barron for the finale in Kenny’s centennial tribute to Dizzy Gillespie.